For other people named Tom Davis, see Tom Davis (disambiguation). 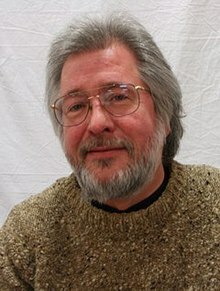 Thomas James "Tom" Davis (August 13, 1952 – July 19, 2012) was an American writer, comedian, and author. He is best known for his comedy partnership with Al Franken, as half of the comedy duo "Franken & Davis" on the Saturday Night Live television show on NBC. Davis was born in St. Paul, Minnesota. He attended The Blake School in Minneapolis, Minnesota, where he began his friendship and professional partnership with Al Franken. In 1975, Davis got his big break as one of the original writers for Saturday Night Live, where he and Franken also performed together. The duo wrote the screenplay for, and appeared in, the film One More Saturday Night, and had brief appearances in Trading Places and The Rutles: All You Need Is Cash. Davis was a frequent guest on The Al Franken Show, appearing in sketches as various characters. In a well-known sketch on Saturday Night Live, he provided the voice calling into an interview with Dan Aykroyd's Jimmy Carter as the youngster that Jimmy Carter talked down from a bad trip. Davis created the SNL sketches "Theodoric of York, Medieval Barber" (with Steve Martin), "Nick The Lounge Singer" (with Bill Murray), "The Continental" (with Christopher Walken), and "Coneheads" (with Dan Aykroyd and Jane Curtin). In 2009, Davis was diagnosed with cancer. He was treated at Mount Sinai Hospital, New York, where, on March 31, 2009, Dr. Eric Genden removed a tumor on Davis' right tonsil that had metastasized to an adjoining lymph node with minimally invasive robotic surgery. Davis died on July 19, 2012, of throat and neck cancer, aged 59. He was survived by his wife, Mimi Raleigh, a veterinarian in Mount Kisco, New York, whom he married in 1991; they separated in 1999, but reconciled before his death. He was also survived by his mother, Jean Davis, and a large extended family. ^ Tuesday (2010-04-27). "The Apiary - A Comedy Website". The Apiary. Retrieved 2012-07-23. ^ "Tom Davis Dies at 59; 'SNL' Writer and Comedy Partner to a Future Senator". The New York Times. 19 July 2012. Retrieved 19 July 2012. ^ Shapiro, T. Ross. "Tom Davis, 'SNL' writer, Franken's comedy partner, dies at 59". The Washington Post. Retrieved July 20, 2012.